Why is Iceland Such a Popular Destination? The Northern Lights dancing over Mt. Kirkjufell in Iceland. 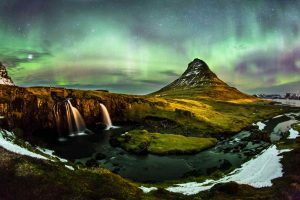 Have your social media acquaintances posted photographs of their recent trip to Iceland? Is your Facebook feed filled with talk of the Blue Lagoon, Gullfoss, and Vatnajökull? Can you even pronounce, “Vatnajökull”? If Iceland has finally made it on your radar, discover why it’s such a popular destination, and how to plan your next adventure there. In grade school, your teacher may have told you the tale of how Iceland and Greenland came to be. As a desperate ploy to trick their enemies, the Norwegian Vikings sent word back to the homeland declaring the land they conquered to be made of nothing but ice. To take it one step further, the cunning Vikings declared a distant frosted piece of land (Greenland) an attractive alternative for their unwelcome guests. This story may be fiction, but the truth lies in the fact that Iceland hasn’t exactly been a tourist destination. In 2012, Wow Air was founded in Reykjavik, the capital and largest city of Iceland. The airline boasted a considerably humble fleet, but its low prices soon caught on with wanderlust travelers of the world. The success of Wow and the growing interest in Iceland gave the tourism industry a boost, and by 2016, tourism was responsible for a share of nearly 30 percent of the country’s export revenue. But What Can I Do There? Iceland is an adventurer’s paradise. From stunning National Parks to breathtaking tectonic plates, the land offers tourists striking natural beauty to appreciate and explore. After a long day of hiking through open terrain, pamper yourself in one of Iceland’s geothermal spas. The Blue Lagoon may be one of the most visited attractions in Iceland, but the island has more intimate options for the coy traveler. If you have yet to experience the breathtaking beauty of the Northern Lights, Iceland is the perfect destination for you. Bundle up in your warmest coat, watch the night sky descend, and witness the mysterious flickering light that dances through the evening sky. The Northern Lights is certainly one for the Bucket List. If you have any questions or want help booking your next Iceland adventure, please contact AESU by calling 800-638-7640, or fill out the contact form found on our website! This entry was posted on Wednesday, August 16th, 2017	at 8:23 am	. You can follow any responses to this entry through the RSS 2.0	feed. Both comments and pings are currently closed.